When we first got Stella almost three years ago, she had no idea what to do with toys. She was actually afraid of some of Argo’s big heavy chew toys. 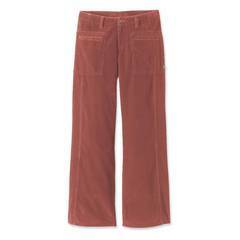 When they fell to the floor with a big, loud thud, she’d run into the other room shaking. But, because both dogs are strong chewers, we can’t buy wimpy dog toys. I got Stella an Orbee-Tuff bone hoping she wouldn’t be afraid of it and it would be strong enough to hold up to both sets of super strong choppers. It was a perfect solution. It’s the toy that taught Stella how to play with toys. She loves to chew on it, even when she was younger and smaller she could easily carry it in her mouth. There are holes at either end that are perfect for putting a small treat in. It has a little bounce when you throw it, and it’s soft enough that it doesn’t drop with a big loud thud. Seeing her march around the living room with her new toy in her mouth made me so happy. Now she plays with all sorts of toys, but her blue bone is still her favorite. 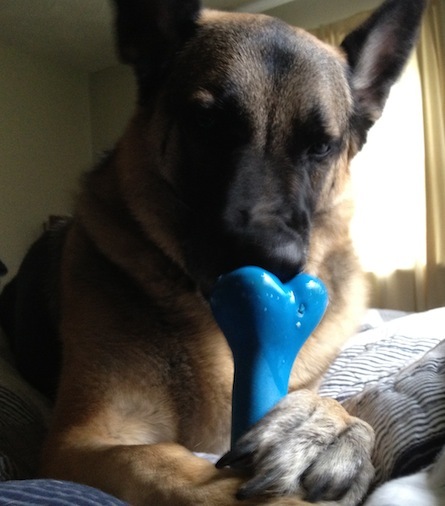 When we first got the Orbee-Tuff bone, I didn’t think it would last very long because the rubber is really soft. I thought for sure Argo would get a hold of it and chew it to bits in seconds. But it’s incredibly strong. Stella has had her Orbee-Tuff bone for almost three years now and there aren’t even any tooth marks in it. The rubber is so soft that it seems to just bend around her teeth. And, it’s non-toxic, recyclable, and made in the USA. Based in Maine, Planet Dog makes many products from recycled materials and accepts used Orbee toys for recycling. Planet Dog gives 2% of every sale of any Planet Dog product to their ownPlanet Dog Foundation, an organization that funds programs that train, place, and support working dogs helping people in need. ”The PDF grants will support a wide variety of non-profit programs that rescue and train dogs to help: children and adults with physical and developmental disabilities; incarcerated men and women; injured service members; at-risk youth; natural disaster survivors and many more people in need. 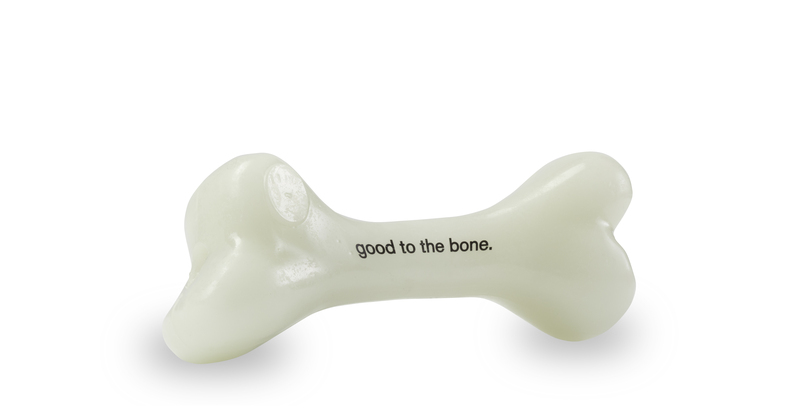 To celebrate, Planet Dog has created a glow-in-the dark version of the Orbee-Tuff bone for the Planet Dog Foundation, and they’ve generously given us TEN to give away! To enter, leave a comment on this post telling us about your favorite dogs. Make sure you use a valid e-mail address when commenting. One entry comment per person, please. On Friday, November 4th, I’ll pick ten winners using a random number generator! Follow Planet Dog on Facebook & Twitter. Winners have all been contacted. Thanks so much to Planet Dog for sponsoring this contest! I’m in love with a little red-headed pup named Lily. She’s an Australian Cattle Dog mix, rescued from a private shelter, and she’s wonderful. Since adopting her, I realize that I’m happiest when she’s happy — and that’s usually outside no matter the weather. My family and I are going to be getting a Malamute puppy so we’re going to be needing some heavy duty chew toys. We used to have a beautiful Akita. Her favorite toys were stuffed animals that she could destroy and get stuffing everywhere. I love rescue dogs! They are so sweet, grateful, and loyal. We have a German Short-haired Pointer and a jack russel/beagle mix, both rescues. My little girl is a bossy corgi named Edie. She’s the most independent dog ever and always wants to play when I’m getting dressed for the day. She never wants her mama to leave! Besides my very own buddy, my fave dogs are the ones involved in the Pawsitive approach program at Guide dogs of tx. Like the prison pet partnership (great choice for grant funds, planet dog! ), the pups at GDTX spend their first 12-16 months doing basic training and socialization with local inmates and the results are amazing. PPP achieved zero recidivism and 100% post-release employment rates rate for three years in a row! All the working dogs – military, seizure, hearing, cadaver, tracking, etc., etc. – blow my mind, but the ones who give prisoners hope, companionship, pride, and purpose and then go on to bless the visually impaired are my faves. Next to my own little buddy. Did planet dog share with you what they use in these to make them glow in the dark? I actually saw a whole rack of these the other day, but couldn’t find any info on what chemical? material? was added. They seem like a legit company, but I can’t help but be wary. My favorite dogs are my Shephard mix Bella and Sharpei mix Lexie. They are crazy but I love them. I just love my bull mastiff mix pooch! My best friend is my 10 year old pug Iris. She has the most endearing soul and spirit. My ten year old Golden Retriever, Bailey. He doesn’t understand that he’s a doggie senior citizen and should not act like a puppy at all times! I absolutely love daschunds. I have a chihuahua-daschunds mix who is my baby. We call her a chi-weenie or a Mexican hot dog She is 8 yrs old & fiesty. I love her! I have a Yorkie-Poo, who is 3/4 terrier, and he chews threw all toys, except these types, within seconds. I would love to have this bone for him, as I know it would last him longer than most toys and give him the chewing pleasure he needs and desires. He has very few toys because so many just do not last for him. I just know he would love to add this to his small collection! My amazing dog is Idol, a Belgian Malinois. We’ve both been learning how to herd sheep. He is a natural at it, me not so much! But with his patience, I’m learning to give him the right commands and learned when to let him do his stuff! He now had his herding intermediate title and we’ve qualified the last two years for the CKC herding trial championships! We have LOTS to learn from our fabulous furry friends! My favorite dog is Uggie the dog in ‘The Artist’ film. I’m star-struck!